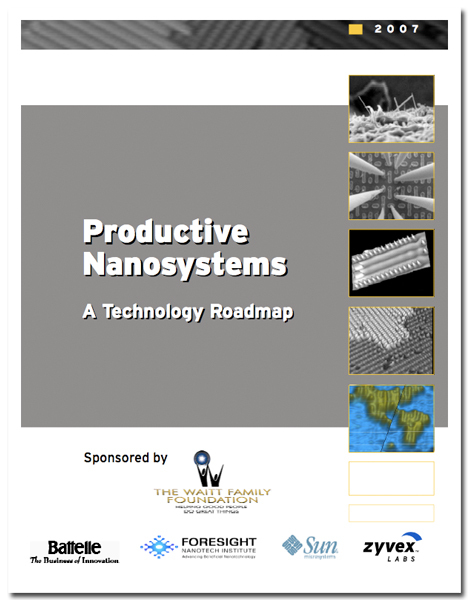 After two years of development, the Technology Roadmap for Productive Nanosystems (TRPN) is now available for download. Much of what I had to say about the utility of the TRPN that might be of any interest or relevance found its way into the Guest Essay I wrote for the Center for Responsible Nanotechnology. One of the points I made mention of in nearly all individual discussions about the TRPN was the rapidity with which very new research areas (and researchers) were presented that, having not been represented at the first meeting, became integral to the tone and content of the final document. The significant expansion of the Working Group membership over the two years of development was another example of the rapid growth in research areas relevant to atomically precise manufacturing, and I take it as both motivating and surely non-trivial the extent to which the National Laboratories and affiliated researchers contributed content to a document that not only sees beyond the states of the various nanoscale disciplines, but begins to approach, in expectation, the foundational aspects of atomic and molecular control that marked the conceptual beginning of this field we now call nanotechnology. Developments in the last 12 months show that the Roadmap is quite timely: As part of a study released last December, the U.S. National Research Council reviewed the technical analysis that I presented in Nanosystems: Molecular Machinery, Manufacturing, and Computation and called for experimental research in support of molecular manufacturing. Subsequently, DARPA issued a request for proposals for developing tip-based nanofabrication at the threshold of atomic precision, and the U.K. government announced grants to research teams developing nanomachines that can build materials molecule by molecule. The Roadmap (2.4 MB) and Working Group Proceedings (14.5 MB) are, at this moment, available for immediate download from www.e-drexler.com, with other locations soon to follow. In addition to what I wrote in the CRN Essay, Paul Burrows from PNNL wrote a guest essay available at smalltimes.com, and the SME TRPN Launch in Arlington, VA this past October was blogged in great detail by Chris Phoenix at CRN.